On February 18th, 2011, our lives were changed forever when our son Christian Taylor Buchanan entered the world. 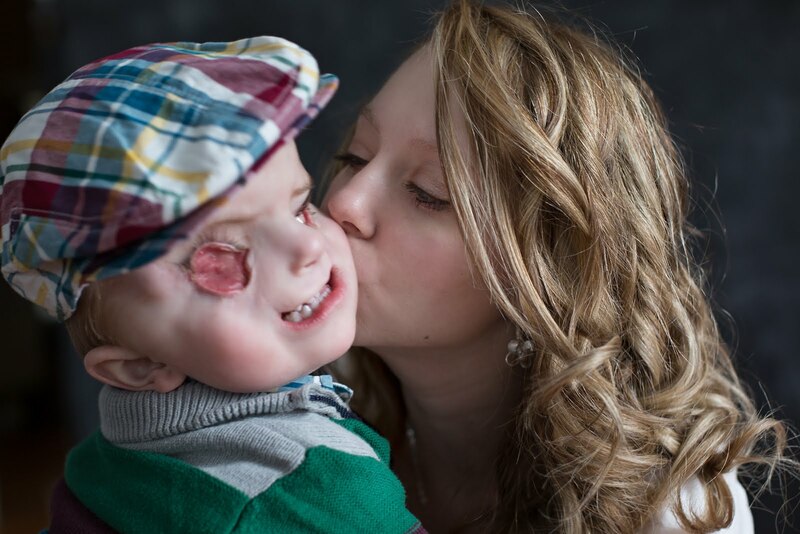 He was born with a bilateral cleft palate and lip and almost completely blind. 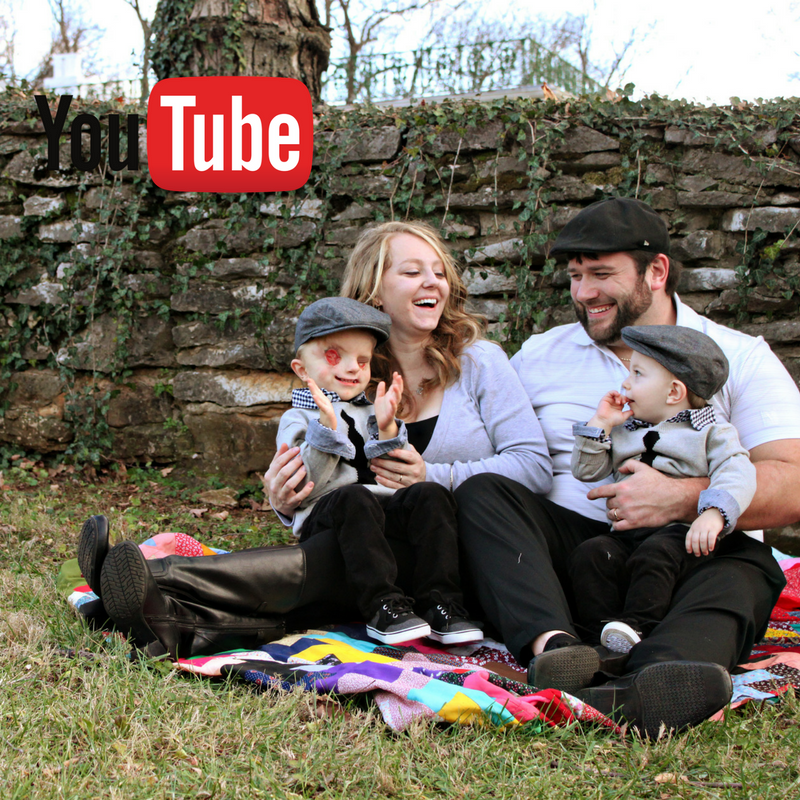 This blog is the story of his life, the joys we share, the challenges we encounter, and the amazing and trying journey ahead of our family! 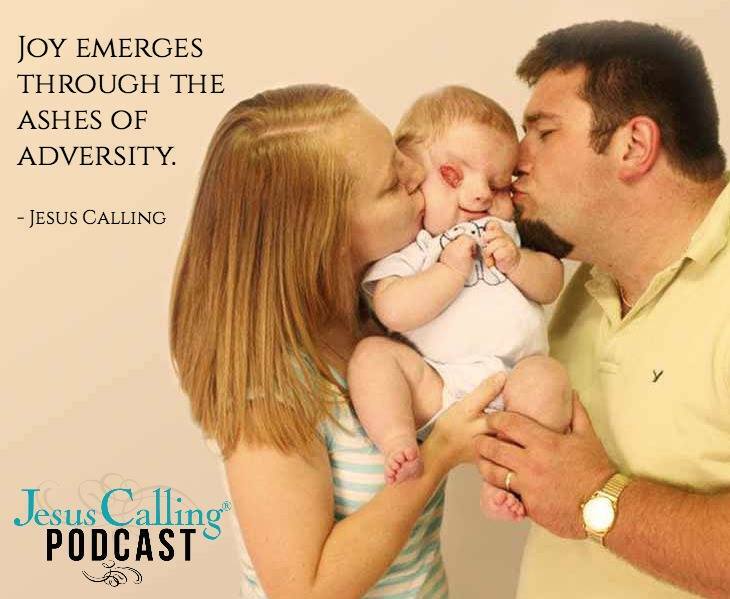 After Christian was born and we realized that he was blind, it was devastating to say the least. Our initial reaction was absolute heartbreak. We didn't know what we were going to do or how we were going to manage raising a child who couldn't see. We had no experience or background in raising kids, let alone a blind child. We spent the first few days thinking about all the things that Christian wouldn't be able to do, like know what colors were, or see our faces, or drive a car, or play football. We eventually got to the point where we realized, however, that we couldn't spend all our time focusing on what Christian couldn't do. We spend our time now focusing on helping Christian do all the things he can do, and doing them well. We want so much for Christian to be successful in life, and if we teach him to focus on what he can't do, he will not succeed. So we have shifted our focus, and we plan to teach Christian where to keep his focus. A lot of people have asked me about Christian's eye and his vision because there has been a little confusion on whether or not he can see some. In my video I stated that Christian was born without eyes. I said "They just didn't form. They just weren't there." This is the simplified version of Christian's condition, for sake of shortening the youtube video, so I would like to elaborate and let everyone who is curious know! 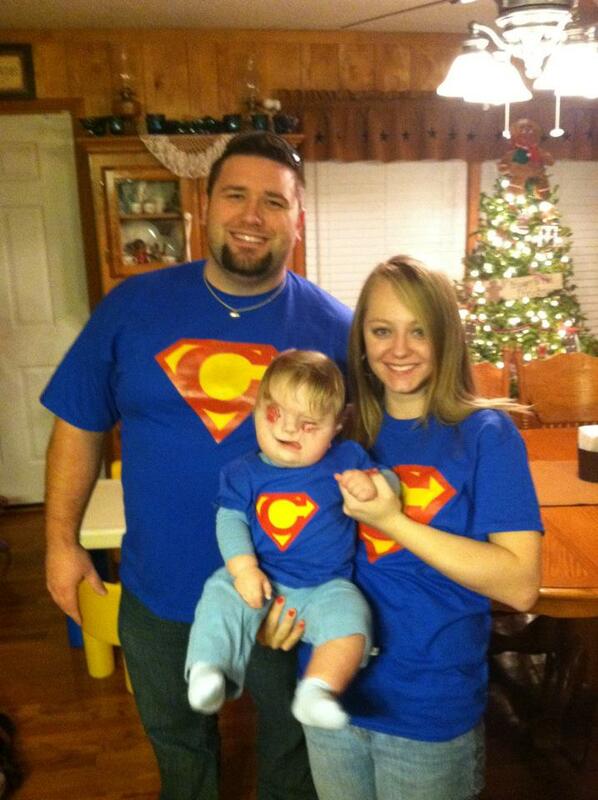 Christian's condition with his eyes is known in the medical world as "Micropthalmia." Micro means small. Opthalmia means eyes. Christian has "some" eye underneath the conjunvtival tissue that is seen. We were told initially by Children's Hospital that Christian was completely blind, but it became apparent fairly quickly that he is not 100% blind. At only a few days old, Christian would jump when we would take his picture and the camera's flash would go off. He would wake from a peaceful sleep when a light was turned on in his dark room. He turned his head away from sunlight on occasion. And on other occasions, turned his head toward it. When Children's did an initial CT Scan of Christian's head, they showed me his eyes and explained that there were bits and pieces of a retina, pupil, and all the parts that make up the eye, but they were not in any order that would produce functional vision. His optic nerves look fairly normal, however. With all that he can see, it is apparent that Christian does not see well. He does not react to facial expressions (smiling at him will not make him smile.) He also doesn't react to things like a television, or objects moving near him like a passing car. There have been multiple times that I have watched Christian feel around for toys that are near him and miss several times before finding it. As far as we can tell, Christian has some light and dark perception at best. His blindness does cause him to have developmental delays, and when you think about it, it will make sense as to why. The reason that babies develop the way they do boils down to pure motivation. They learn to crawl because they see a toy they want to get, or so they can get to mama. Christian does want those toys, and he wants to get to me, but because there is nothing for him to look at, he doesn't grasp the concept of the space around him like others. and how to move about in that space. So he has to be taught that reaching out or moving forward will get him the desired results, where as other babies figure it out on their own. Christian has done plenty of things without being taught that totally surprise me, though. He learned to reach out for a toy with very little effort. It almost came natural. It seems like such a simple concept to us, but think about a 3 month old who can't see. How in the world do they know to extend their arm and grab a toy? I'm not sure of the answer, but I do know that Christian learned fast! He also learned to pull up to stand on his own. This was also a motivation thing for him. Christian is learning more and more about boundaries and space around him. And he has learned that he likes to explore the world around him to find things to chew on. So he learned to pull to stand all by himself while in his crib so that he could chew on the crib rails. Yes, he is silly. We are still in the early days of raising Christian. We still have many more blessed years to come in raising our little man who will one day be a big man. In all that in between time, I am praying for guidance in helping Christian to become a God fearing, God obedient, successful, happy, productive, loving adult. I hope this gives everyone a glimpse into the world of raising Christian with a focus on this one particular aspect. I also hope it answers everyone's questions about his vision! Please feel free to ask questions as well!!! Quick question....I was wondering this before the post....will it be possible to do an eye transplant if he has all of the other functioning mechanisms? Just curious if that has been brought to the table. It's going to be a lot of fun to follow along with Christian as he grows up...he's already quite the little celebrity...and the expression on his face in his photo up top is hilarious! Thank u Lacey :)i Very informative! Great post! Clears up many questions and I personally was glad to hear that Christian has at least some vision. My father worked for blind society as a chief-engineer in USSR - he inspected enterprises where blind people worked. I remember he told me that for blind people to distinguish light and darkness is a big deal. They consider it to be a good fortune! I pray God for wisdom for you and Chris in raising Christian! With Him all things are possible! thanks for letting us know about his eyes. I'm happy to hear that he's not in total darkness. and I, too, wonder if some day he can have a corneal transplant if the optic nerve is intact. we can hope for the future. raising any baby is a learning experience. you and Chris are doing great so far. Lacey thank you for letting us into your world. Christian is absolutely adorable. I can't imagine how different it is for you to teach him theses things. So thankful that you are able to take him to different types of therapy to help with all of these things also. You guys are a remarkable family. I know that , for meat least, it has only been a week since I have been following you. Yet it feels like it has been longer. I have really changed as a follower of Christ. I truly believe it is because of you and Christian. Thank you again for letting us into our world. Hugs to all three of you, especially Christian! Could you imagine if he did actually receive all of the hugs from all of us, he would never have time for himself. He is truly loved. everytime i read your blog,give it me a proud feeling. Tell lil superman, the entire world is watching him grow now! With all the bad things going on all over, Christian is just what we needed! It is a shared love affair for all the world to come together as one, such an amazing thing and all because of your boy, God truly knew what he was doing when he let you borrow him. What a blessed couple, you were chosen! Hello Lacey, Christian and Chris and greetings from sunny Hong Kong! Yesterday, I saw your youtube clip in the morning by myself and then shared it with my almost 7 year old daughter after dinner. I didn't want her to become one of those kids that ask their moms..
And after we watched the clip, Lokyi agreed what a beautiful baby Christian is, and we prayed that God would heal his eyes so they don't hurt and that he can see! Thank you for sharing your lives with us, and know that, even as far away as HK, you have prayer and support coming your way. Love in Christ makes us family! You are such an amazing mom and Christian seems like such a blessing, he is so adorable. My son has a rare medical condition and people would ask me questions like "what did you do while you were pregnant to make him that way?" Its beyond insane how rude and hurtful people can be when they don't understand things. You probably have no idea how much you will be helping and inspiring parents of children with medical conditions especially ones who have the same condition as your son. Thank you for giving all of us a chance to see to your beautiful son Christian he is such an inspiration. I will be praying forhis vision, God can do anything. Praying that Christian sees one day! I find your story very inspiring and I wish I stumbled upon it sooner than this past Sunday. I too have a little boy (5 months today!) and aside from him, nothing has given me more joy over the days than looking at your sons glowing smile. I also find this blog to be a great way for me to feel somewhat a part of your family. I, like many of the others who have commented on this blog, wish that one day your son will see perfectly. I would also like to take up your offer of asking a question. Given Christian has some sight in his eyes, would removing some of the tissue around help at all? Or is that extremely risky? Given my medical knowledge of reading a pamphlet or two in a waiting room of an OBG, I'm probably wrong in thinking this would work but I'm curious to know if there is any procedure that could help your little man out. Thank you so very much for sharing Christian with us all. He sure is a cutie-pie! Hi there! First, I'd like to say that the three of you are amazing people who have given inspiration to us all. With all the bad stuff going on in the world, you guys are a shining beacon of light and hope through the storm. I had a couple ideas I wanted to run by you. First, there is an organization called Leader Dogs for the Blind. They are located in Michigan. They offer free guide dogs and training and other programs. Their website is www.leaderdog.org. Second, as much as I hate reality shows, have you considered contacting producers and discussing doing a rality show about your family. I don't watch any of those types of shows, but I would watch a show about you guys. It would be informational, inspirational, and just plain fun to watch Christian grow and learn. I also think it would help other families with special needs children. Anyway, I will definitely keep up with your blogs and videos. Do you have a post office box set up to receive donations and gifts for Christian? Thank you for sharing all of this information! My daughter (7 1/2 yrs old) is visually impaired (due to ROP) so I can relate to alot of what you are saying, and I've been following your story ever since viewing the youtube video on FB. Praying that the Lord will continue to bless your life abundantly and that His love and grace will continue to shine brightly through Christian! Thank you Lacey for this article. You've answered many questions that I had. Don't worry, Christian is blessed. I'm happy that his optic nerve did not get damaged, which will make the shortly coming treatments easier! Last year Makoto Asashima, A Professor in the University of Tokyo, successfully grew complete eyes from stem cell-like cells of a frog embryo, which were then transplanted into tadpoles. The results were very promising and pleasing... I'll leave them for you to read. I LOVED your second paragraph. Thank you for sharing that information. I am so grateful that you have been sharing christians journey with all of us. My little nine month old was also born with a vision impairment and recently underwent surgery on both of his eyes. I know that this has caused a delay in his learning as well, but he is doing great now. take care of that sweet little one! I pray Christian will be able to see one day. The advancements in technology have come so far. My daughter was born a premie and her eyes were severely crossed. After several surgeries she can now see straight but will never have depth perception. I know that is mild compared to what you are going through. I just know you are in good hands and he will always be able to see and enjoy eye sight one day. Stay strong and keep on doing great! Thank you for sharing your story with the world. Just watched your video, and was so touched to see Christian:) He is adorable, and lucky to have you as a mom. Your strength and confidence is insipring! Hi Lacey, you don't know me but I am one of so many who saw the video you made for sweet Christian and was incredibly touched by it. My sister sent it to me on a day that I really needed to see it, as I can relate. I have a beautiful three year old daughter who had suffered a severe amount of damage to her brain in the womb for some reason. The doctors have never been able to determine why and wonder if it is genetic. Today, she is a sweet, happy, beautiful three year old girl. She does have multiple disabilities and is unable to walk, talk, feed herself, and is visually impaired. But, like your video stated, she is the love of my life and has touched me and everyone who comes to meet her. Thank you so much for sharing your story. It was so beautiful. Christian is abosulutely perfect in my mind... a perfect example to all of us of, as are you as his loving mommy! You're doing the exact right thing in talking to Christian constantly and describing what it is you're doing. You may not realize it, but your voices are taking the place of his eyes, at least for now, and as he grows older and more advances in medicine become available, there may be something that can be done to help his vision. The both of you are terrific parents - never believe otherwise. Christian is a true gift from God and He knew you'd do your best and love Christian as he deserved. Thank you so much for sharing your story and Christian's progress. You are such an inspiration. I pray that God continues to bless you family. Sending hugs to your precious little boy. looking for the "respect "button !!! Hi guys! I have raised a child ( who is now an adult) with Autism. And when he was diagnosed..21 years ago, I too was in that same place of "what is he never going to be able to do?" After feeling sorry for him and myself for a minute. I also changed my view. I moved from what he couldn't do to what he WILL do! Although he could see,he was much of the same way.. He couldn't understand what he was seeing and how to put it all together. It was a very long and hard road to travel.. But I never gave up on him..And I know you won't give up on Christian either... You will make it through because God has given you to him! And what I mean by that is.. God knows who can do it and who is best for the job of each child.. We were chosen to be parents of these kids.. I can't nor will never ask the question why?.. All's I know is he did, and I like yourself were put here to do this job and bring awareness and education to others about compassion, support,acceptance and faith. You 3, just keep pushing along, the mile stones will come ( they may be a little different then other kids) but believe me, they will come! :o) Enjoy your ride, God has all the plans in place for your journey! What a blessing for you! Christian is lucky to have such amazing and loving parents. I love his huge smile. Thank you for sharing your journey. Early intervention will prevent significant developmental delays. Since he can't take in the world visually, bring it to him to get him started on his early concepts. When he's able to explore he will naturally start to discover the world on his own. One example, put toys that make noise outside of his reach and let him search for them. This will teach him that there is more to the world than what is within reach, and therefore more worth exploring. When he starts to walk give him a cane, this will not only protect him by acting as a bumper but encourage him to explore even more, adding to his conceptual development. It's not much more difficult to raise a blind child than a sighted child, just different ways to do it. I encourage you to talk to other parents who have raised blind children. NFB.net is a good place to start. We have seen your video and your story has touched us and the Christian. It is a beautiful child, and the smile of your photos is perfect. We want to thank you for the courage you have and show the world what is truly important. As you say, your son is the love of your life. We hope you enjoy many years together. HI Lacey! So nice to see Chris in the picture above! I was beginning to wonder if he stuck around for the long haul -- he wasn't mentioned in your video after the delivery, and all the pics are of you and Christian. Nice to see he is with you! Bless you too Chris! If you need some inspiration, some strength -- get the two books -- "The Boy Who Came Back From Heaven" and "Heaven is For Real" ... the power of prayer is amazing, and God is even bigger than that! Thank you for posting your video! I just saw it today and appreciate you sharing such a beaurtiful story and just wanted to support you with words of encouragement. 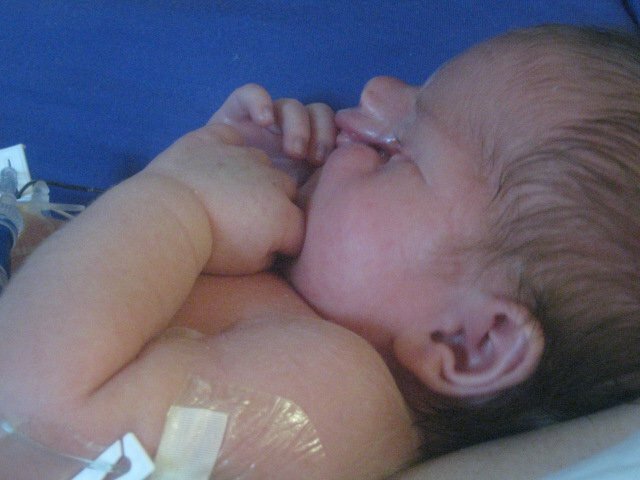 My daughter has a brain that didn't fully develop but we didn't know until after she was born(not that it would have made a difference for us). It's amazing the joy and beauty these little ones bring to our world! You're an amazing mom! God's blessings! I have a 9 month old baby boy and I know that feeling of them being the love of your life! I can see how much you love your beautiful little Christian and how much he love's you back! God is truly using your family for his good! I am so touched and moved by your video and story I want every one to see it. Every one I talk to I tell them to watch your video, I called K-Love this morning and asked them to watch it too. God truly blessed you with an amazing gift, a beautiful little man inside and out (but you already know that) :) I will keep you in my prayers as well as pray for the truly blind people that feel the need to leave you hurtfull and negative post! Thanks for the clarification about Christian's sight. I thought I could see at least one of his eyes in the photos. I assume that you mean he also has an eye under the tissue of his right socket. It's a great thing that he so quickly responded to light. Some friends of mine in Michigan have a son who has severe vision problems, and is also albino. But he is a highly intelligent young man. As his vision deterioriated, he research and then designed a device which his ophthalmologist built, and it has served him well. I was wondering if you would elaborate more about some of his surgeries. 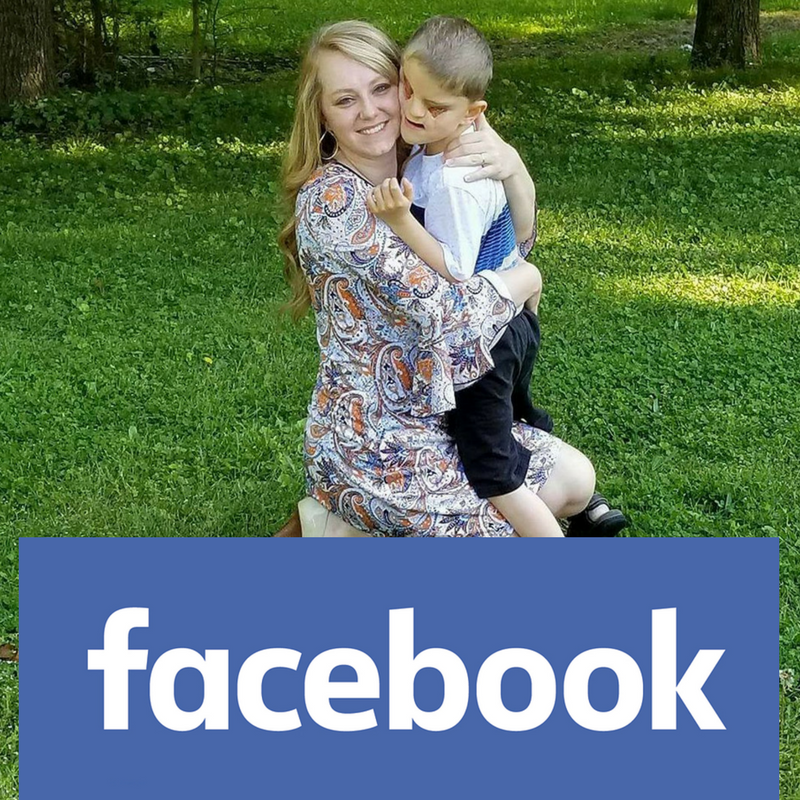 Obviously, I'd like to know (I'm a mother of 8 kids, ages 1-13, so this story has intrigued me--and them), but I also know that because the experience was devestating, you will forget many of the details you think you will remember, and one day Christian will want to know. I certainly don't mean to take any more of your time, and wish for you the best. Regardless of Christian's long-term prognosis, he will compensate for any vision impairment in other ways. You will be absolutely amazed. Love you all and thank you for sharing Christian with us. I know you have already answered the question regarding the possibility of an eye transplant, however, I was wondering if in the future doctor's will be able to provide Christian with glass eyes? I once saw a video about a boy who inserts glass eyes on a daily basis. Your family is strong and inspirational! Thank you for sharing your story. I am heartbroken to see that you have been attacked for your decision and I pray that the positive reactions will outweigh the negative. You Your story is truly beautiful... as are you and your son. I wanted to ask, if you don't mind, about the reactions you described by people in public. I have 3 young boys, ages 6, 4 and 11 months. How would you suggest I teach my children how to appropriately react to seeing a child who looks or acts differently than they are used to? Is it okay to ask questions of the person? Or should I coach them to ask me later? I would love to hear your insight. You don't have to be like everyone else or look like everyone else to be beautiful. Christian is a precious baby, and he was put here for a reason! As a matter of fact, those differences are what make our children so beautiful. I teach my son that the differences in people are what makes them special, never judge a book by its cover! People like you are truly an inspiration, you're a great person, and your amazing little boy is too! I would say the naive people who think this baby boy is anything other than awesome are the blind ones! Thank you for sharing your story. Thank you for saying "yes" to life! you have a beautiful baby boy, who will gain many strengths most of us will never have and i just know God will use your family for greater things, his promises are true. I admire your amazing strength for you and your son. I pray that your strength increase with each passing day and I will also pray for a miracle that your son will someday soon see the face of his wonderful and loving mother and much more. my love and prayers go out to you and your family, May God continue to bless you and keep you safe. Thank you for letting us into your life and enjoy the milestones that Christian is making! He is a very special little boy and God has blessed you with being his parents. You are truly an inspiration to us and I am sure so many others!! i do salute you, lacey & chris! do NOT get beaten, do NOT back off! your son has done nothing wrong and he deserves what you do with and for him! there are so many evil people alive, he is the opposite, if there is anyone who has a right to be here, it is him. i am not a religious man, i dont grasp the concept, i'm sorry. however: when looking at the facts of development of humankind from a technical standpoint, through my engineer's eyes: all i can think of when reading your post is gordy laforge, the character from the enterprise. and no, i am not trying to ridicule anything or anybody. but think of this: you say his nerves look allright, but the "sensors" are not. some people already suggested transplants. noone knows today what we will be capable of inventing and creating as humankind 20, 30 years down the road! i am 40 years old and i remember cars with no seatbelts, hardly any electronics, no airbags, none of the assist and life saving systems we got today. look at the medical sector, too. our kids were born after 23 weeks of pregnancy, one had a 100% prospect of dying after losing what people believed was 86% of his intestine. doctors said, as little as 10 years back there was nothing they could have done for them. and they called the survival a miracle! bottom line: do not give up! whoever it is, nature, humankind or god: development can not be halted! and it is your job to keep your precious son ready to receive what will be invented. and you are doing this job phantstically. again: i salute you! I came across your blog as I did a search for Parents of children with blindness. We are in the process of adopting a sweet girl that was born without eyes. I would love to email with you about expectations and such. My email is keh1027@gmail.com. Read Lacey's New Book Now! 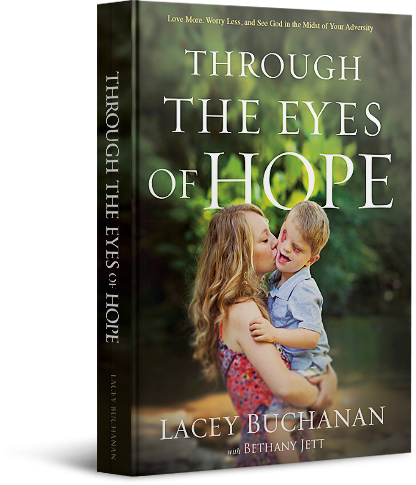 - Through the Eyes of Hope - Click here! 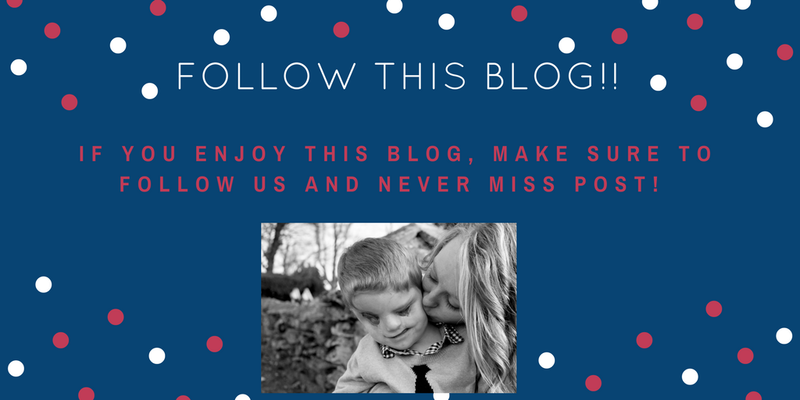 Click the Follow button to stay updated on our blog! Click this Photo to Find us on Facebook! I am a Christian, mother, wife, daughter, aunt, sister, and friend to some amazing people. I am a student at Nashville School of Law. I work at a daycare. I am passionate about disability advocacy and education. 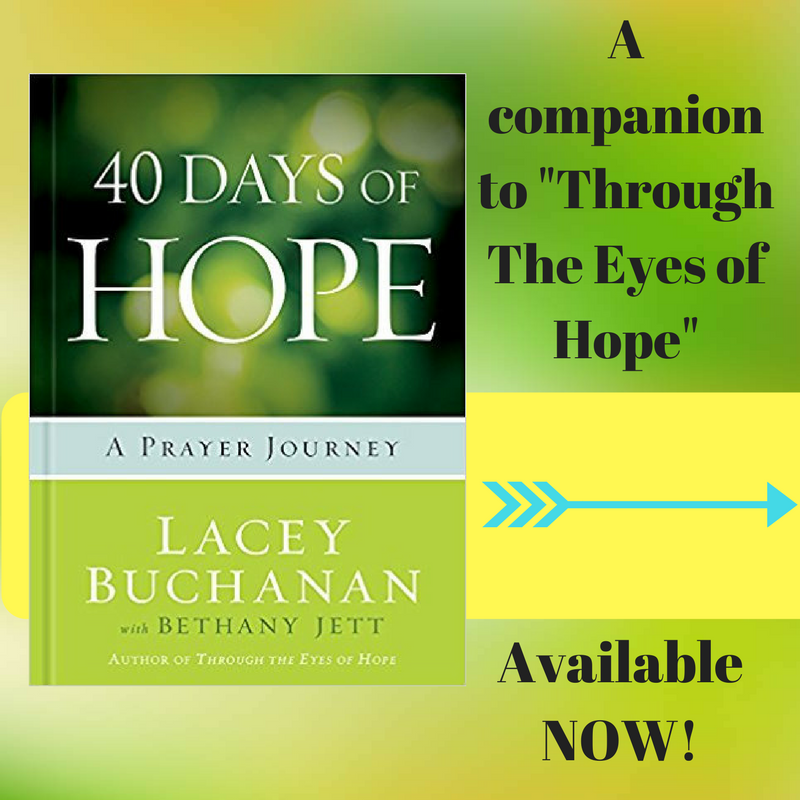 The Companion to Through the Eyes of Hope is Available Now!